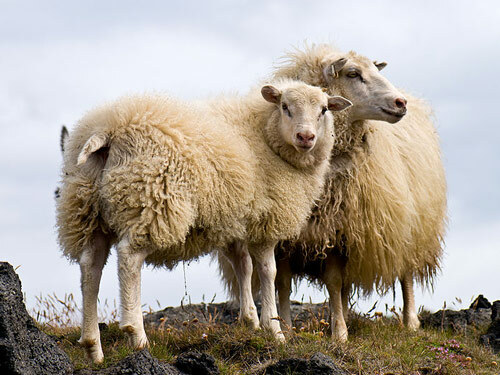 Icelandic Sheep are a medium-sized, upstanding sheep, with a light frame and a naturally short fluke-shaped tail. Although the majority of them are horned in both sexes, polled rams and ewes are common. The horns of the ram are strong and well rounded; the ewe's horns are finer and usually swept back. Four horned sheep are found occasionally in Iceland, but none have occurred in the UK. The fleece consists of a dual coat of very fine under-wool and an outer coat of long hairs and is found in all the natural colors, including a wide range of browns. Broken colored sheep are common, the patterns ranging from limited markings, such as speckled, to large patches of color on a white background or the reverse. Darker dorsal stripes are often found, Mouflon and badger face patterns occur. Grey sheep may have a black outer coat. Average mature ewe weighs up to 60kg, rams 90kg. Content and Photo Source: National Sheep Association.